I had a really busy day, but wanted to post a quick rundown of how I did yesterday on Medifast. At 7:30 I had a Dutch Chocolate 55 Shake made in the blender with ice cubes. This was much less bitter than the Dark Chocolate Antioxidant Shake I had the other day, and I liked the flavor and texture. But there is still a bit of aftertaste that I just can't figure out. I have never been a big fan of artificial sweeteners so maybe it's that, although the Crunch Bars and the Hot Cocoa had NO bitter aftertaste at all. Around 9:30 I decided to be brave and try another flavor of oatmeal. I made the Maple & Brown Sugar Oatmeal with only 1/2 cup of water, left to soak in the fridge for a couple hours and then microwaved. It smelled really good, like maple syrup. And it actually looked like oatmeal, not soup! If you saw my review of the Apple Cinnamon Oatmeal the other day you know this is a vast improvement. However, I still did not like the taste. It was better, but still kinda icky. I added a teaspoon of ground flaxseed and 1T of 2% milk (each of those counts as a condiment with 3 allowed per day). I guess I just am not a fan of the Medifast oatmeals. At 11:30 I was hungry again. I decided to eat part of my daily protein as a pre-lunch snack: one soft boiled egg (3 whole eggs are allowed as a dinner item once a week). Oh it tasted SO amazing! Just delicious. I think that while Medifast food is mostly palatable and even tasty, there is nothing as yummy as real food. I am sure I will appreciate real food even more (especially fruits) after I am done with Medifast! Then it was time to get my daughter ready for preschool. Before we left, I had another 'part' of my lunch: a salad. 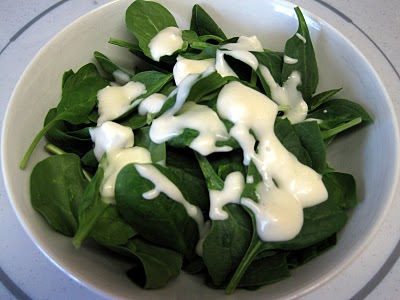 I used 1 cup of spinach (counts as one vegetable serving) with 1 T light blue cheese dressing (counts as a fat serving). Ran some errands and went for a leisurely walk in the sunshine. As I walked and afterwards, this wonderful happy feeling flooded over me. It's the same feeling I get when I am 100% on plan (with whole foods) and OFF sugar and junk. And the Seasonal Affective Disorder is really gone (I think because I was using the full spectrum light for awhile and then it got sunnier and I started making sure I got outside every day). I feel absolutely great. Fully alive. Happy. Thank goodness for this wonderful spring weather! Between errands I had a Medifast Lemon Meringue Crunch bar and a bottle of water. It looked pretty much like the other crunch bars I've reviewed. It tasted nice and lemony. I liked it a lot. These bars are actually chewy, not hard, but have a crunch to them sort of like a Quaker granola bar does. Later in the afternoon I snacked on the Honey Mustard pretzels (a favorite of mine) with water. And dinner was this really delicious tuna salad: 4.66 oz of canned tuna (drained, which is pretty close to 2 small cans!) mixed with 1T lite mayo (healthy fat serving) and a chopped dill pickle spear (optional snack). I served it over a cup of chopped romaine with a side of 1/2 c steamed broccoli. Yummy and filling! I had a nice, long, hot bath and then at 9PM had my Banana Pudding. It was really tasty. I loved the banana flavor and it was creamy and smooth (I mixed it very gradually with a whisk and then refrigerated it for a half hour). It wasn't quite as thick as I would like but I will just use a little less water next time. Another very good day. I have to say that the other day I was in the grocery store and walked past the bakery and saw some stuff that made my inner child almost tantrum right there on the grocery store floor. Brownies with mint cream piped over the tops of them. Mint chocolate Oreo cake. And to the side, by the deli, fried chicken strips. For a split second I just WANTED it all. Just for a fraction of a second I remembered when I'd buy anything I wanted, take it all home and eat it within 15 minutes. And I felt a little sad that I couldn't do that now. And then, in a flash, it was gone. I didn't really care about that stuff. I knew it wouldn't taste as good as I imagined it. It was just a fantasy. I walked back to my reality, without cake. And that is the only time in the last 4 days that I have had any inkling of a desire to eat junk. Can't wait to weigh in on Sunday! good to hear it sounds like it's all going well. It's a plan, different from what you are used to, but you are following it! Good for you..I hope the scales show a decent loss this week Lyn. I am berating myself. I bought myself a pack of caramel rice-cakes...4 25g packets per pack..and low fat, low sugar etc, and 101 calories. I realise the 'binge' eating still gets to me...I ate 4 packs one after the other, they were so moreish :-( So much for a little treat when I fancy one. You have shown restraint Lyn...and I must try to find some. You are very disciplined...and I hope it pays off for you. Its great that you have started to like it. I started Medifast this morning! 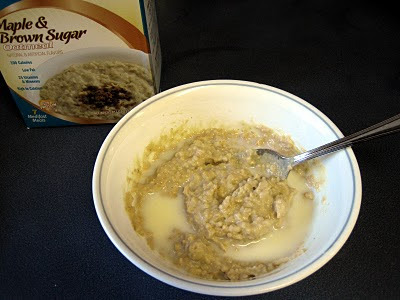 My first meal was the Maple/Brown Sugar oatmeal. I let it soak for about an hour or so before popping it in the microwave. It was good! And very filling. The only think I feel so far is thirsty... I've already drank 32 oz of water this morning. But the sun is shining, and I feel so positive! I have packed the lemon crunch bar and some kind of crunch-puffs, as well as the chicken noodle soup to have at work today. I followed your advice, and already have the soup soaking in water! Thanks for posting - and I am so glad that you feel so good! Great weather always lifts the spirits! sounds like the food is treating you pretty good too. Change and structure can sometimes jump start a diet like nothing else. I agree that eating a homemade whole food diet is best and what you should do long term, but I feel like medifast may be pushing you in a good direction. I am excited for your weigh in!! You are doing so well! Lyn ~ My favorite quote from Einstein is his definition of insanity: "Doing the same thing over and over and expecting different results." I understand why you are doing Medifast to shake things up and break yourself out of this plateau. I think you are doing the right thing to make a total turn-around of what you have been doing. Keep up the good work, and I will keep cheering you on from the sidelines! "I think that while Medifast food is mostly palatable and even tasty, there is nothing as yummy as real food." You said a mouthful there.